According to a new study led by Italian scientists at the National Institute of Astrophysics in Bologna, a frigid lake of liquid water full of salts may lie beneath the frozen ice cap at Mar's south pole. This lake would resemble one of the interconnected pools located under several kilometres of ice in Greenland and Antarctica. 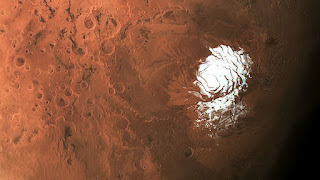 Since the the European Space Agency's Mars Express orbiter launched over a decade ago, the Mars Advanced Radar for Subsurface and Ionospheric Sounding (MARSIS) has beamed radio waves onto the planet, with some penetrating up to 3 kilometres of ice and rock. In recent years, MARSIS scientists began to detect small, bright echoes underneath the southern ice cap suggesting liquid water. These results were doubted at first and warranted further investigation. The spacecraft later confirmed the existence of the bright reflections during 29 passes over the southern polar region. The brightest patch, offset 9° from the pole, lies 1.5 kilometres under the ice and spans 20 kilometres. Through data concerning the signal power reflected by the bright patch, the scientists were also able to gain data on the permitivitty of the material (its ability to store energy in an electric field). It was found that permittivity of the patch was higher than anywhere else on Mars - and comparable to the subglacial lakes on Earth. However not everyone on the MARSIS team was convinced. “I would say the interpretation is plausible, but it’s not quite a slam dunk yet,” said Jeffrey Plaut, a MARSIS team member at NASA's Jet Propulsion Laboratory in Pasadena, California.